86-87 o-pee-chee 37 rc 6 4nm, 1ex, 1vg. 87-88 o-pee-chee 191 15 12nm, 3ex. 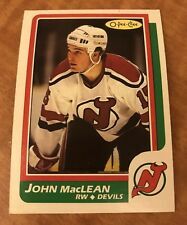 John MacLean RC (29) Vintage Hockey Card Lot. The stated card in the title of this auction will be the card you will receive. The Player Name, Year of Card, Manufacturer, Card # and Condition of actual card is stated in the title. See scan for more on the condition of card.. FOR CANADIAN AND INTERNATIONAL ONLY. CARD IS GRADED 8 BY KSA IN NEAR MINT/MINT CONDITION. 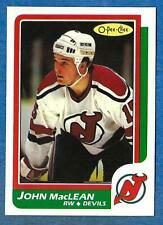 GREAT COLOUR & GLOSS--A VERY SHARP, CLEAN &ATTRACTIVE VERY IMPORTANT CARD FROM THIS VALUABLE O-PEE-CHEE HOCKEY SET! NO CREASE, CLEAN BACK. P.E.I. 14%. NOVA SCOTIA 15%. SASKATCHEWAN 5%. OTHER PROVINCES AND TERRITORIES 5%. GREAT COLOUR & GLOSS--A VERY S HARP, CLEAN & ATTRACTIVE VERY IMPORTANT CARD FROM THIS VALUABLE O-PEE-CHEE HOCKEY SET! CORNERS ARE SHARP. CARD IS GRADED 8.5 BY KSA IN NEAR MINT/MINT CONDITION. 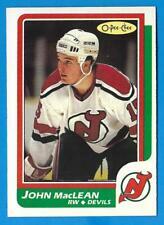 GREAT COLOUR & GLOSS--A SUPER SHARP, CLEAN &ATTRACTIVE VERY IMPORTANT CARD FROM THIS VALUABLE O-PEE-CHEE HOCKEY SET! THE EXACT CARD PICTURED IS WHAT YOU WILL GET. GOOD LUCK FANS! IT IS GORGEOUS AND READY TO BE DISPLAYED.THIS WILL MAKE A PERFECT GIFT! GRADE - NRMT OR BETTER. MORE THAN 25 CARDS WILL SEND ON THE INVOICE.